Death records for Gogebic Count are available from 1887, although actual certificates for viewing or printing purposes are available from 1934 only. Birth, marriage, and divorce records are all available from the year the county was founded, 1887 to the present. Other records, such as veterans discharges, civil and criminal records, and others are also available with varying dates of availability. Gogebic allows vital records researchers access to the County Clerk's office on weekdays only, from 8:30AM till 12:00PM, then 1:00PM till 4:15PM. Copies of records are available for $7 for the initial copy, and $2 for additional copies of the same record. 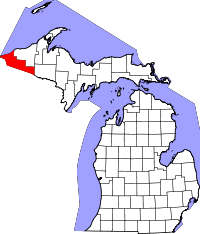 Gogebic County is the furthest west of any county in Michigan, bordering Wisconsin to the southwest and Lake Superior to the northwest. Lake Gogebic, which is the largest lake in the northern half of the state, is located within the county, along with part of the one million acre Ottawa National Forest.